Here’s another of those magnificent war–time 2060 Leverless pens. This one has something that I’ve never seen before, but that should not have been unexpected: a replacement number six size Phillips nib. 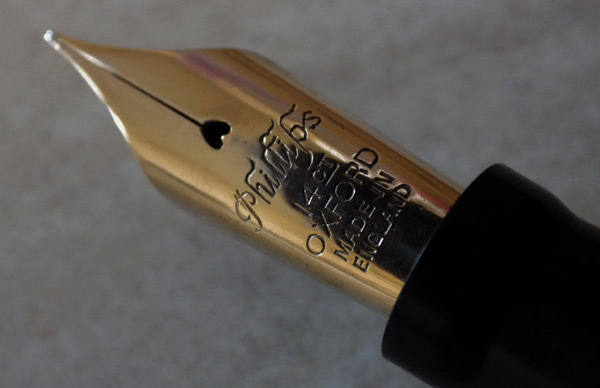 It’s a handsome nib, medium and not without some flexibility. We can date these pens fairly closely by the central Swan image which appeared during the war and might have continued as late as 1948. This one’s in good condition apart from the cap rings. They have lost most of their gold plating and they move, though they are in no danger of coming off. There was a time when I could be confident that I would see one or two of these mighty beasts every month. Those days are gone I’m afraid. They appear much less frequently, and when they do they cost rather more than they did. Perhaps that’s justified and it’s only now that these pens are reaching their true value, but it does seem a shame that they are beginning to be priced out of the reach of many who would wish to own and use one. These pens appeal to me because of their girth. A thick pen is more comfortable for someone with arthritis. I’m also very fond of Leverlesses. Despite the state of the rings this one has a glorious gloss. I wonder what happened to it. Probably it took a nosedive into a concrete floor at some point, which would be enough to destroy even the massive Swan number six nib. The Philips replacement makes it quite special, to my mind. Excuse the dust in the photographs, particularly in the one of the barrel imprint. Dust is the bane of my photographic life. What a splendid Swan; the photographs suggest that it is a whopper! And your information given here about the Swan image is helpful; I have a grey 4230 which carries exactly the same image in its trade-marking. Thanks! Yes, it’s one of the things you can use to arrive at a reasonable estimate of date. Now that is certainly the pen for my big hands!